There’s no doubt about it that the big news on the new Sony a7 II is its new 5-axis image stabilization system. It’s a camera-based sensor shift mechanism that can move the sensor along 5 different axes to counteract camera shake when using slow shutter speeds. Sony claim the new system can offer up to 4.5 stops of image stabilisation when shooting stills, which is more than currently available on Nikon and Canon’s lens based systems on full frame pro DSLRs. Sony’s 5-axis system is effective for shooting video too, making the new Sony a7 II even more versatile in low light and other scenarios where a tripod may previously been required. Being a sensor shift solution the new Sony a7 II can also offer image stabilisation using A-mount lenses or E-mount lenses that don’t feature Sony’s lens based Optical SteadyShot (OSS) system. If you are shooting with OSS lenses however fear not, as they are also compatible with the new Sony a7 II and the two image stabilisation systems work in tandem to prevent camera shake. 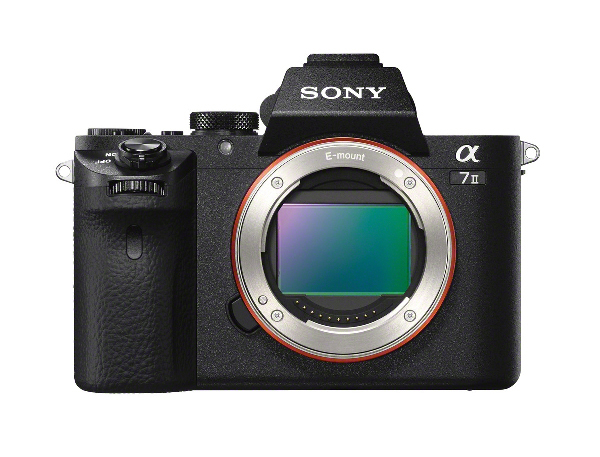 There have been some other minor, but significant, changes to the build and design of the new Sony a7 II. For instance Sony claim that a combination of the Sony a7 II’s new larger handgrip, together with repositioning the shutter release button, which is now in a more ergonomically friendly position, both improve the handling of the latest model. The front panel has now been upgraded to magnesium alloy, instead of plastic, to fortify the A7 II’s overall build quality. Add to that the weather sealed main buttons and dials and reinforced lens mount for attaching heavy telephoto lenses, and the a7 II is more equipped to handle the rigors of professional shooting. At the heart of the new Sony a7 II remains the same 24.2Mp 35mm full frame Exmoor CMOS sensor from the original a7. Many other specs and features on the new model remain the same as its predecessor too, including the hybrid autofocus system featuring 117 phase detect targets alongside 25 contrast detect points. Sony claim the new AF system is more responsive and up to 30% faster than on the original a7, and features improved algorithms for a 1.5 times improvement in autofocus tracking. The a7 II’s quick start time is 40% faster too, so you can boot up and get shooting that bit quicker, and for image processing the a7 II continues to use Sony’s flagship BIONZ X image processor for high quality rendering. The Sony a7 II shoots Full HD video in either AVCHD or XAVC S format, which can capture 1080/60p video at 50 Mbps, and the tilting White Magic LCD screen promises good visibility even in bright light. For more traditional framing the built-in electronic viewfinder offers a XGA 2.4m-dot resolution, high contrast OLED display and 100% frame coverage in both full frame and APS-C shooting modes. The new Sony a7 II will be available in Europe from January 2015 with pricing still TBC. Utilising the same 24.2Mp Exmoor CMOS sensor as its predecessor we expect image quality on the new Sony a7 II to be in line with the original a7 model. That’s no bad thing though as the a7 series are really taking the fight to both the hybrid competition, as well as full frame professional DSLRs, when it come to image quality. With 3 different resolutions, 12.2Mp, 24.2Mp and 36.3Mp available on the Sony a7 series full frame sensors, there’s an option to suit most photographers needs, be it for stills or video. The highest resolution 36.3Mp leads the way in terms of sensor scores however, sitting in 3rd place on the DxOMark database for all sensors tested. The lower resolution 24.2Mp a7 and 12.2Mp a7S don’t quite match up to that, but with 90 and 87 points respectively they are still among the best sensors we’ve tested. 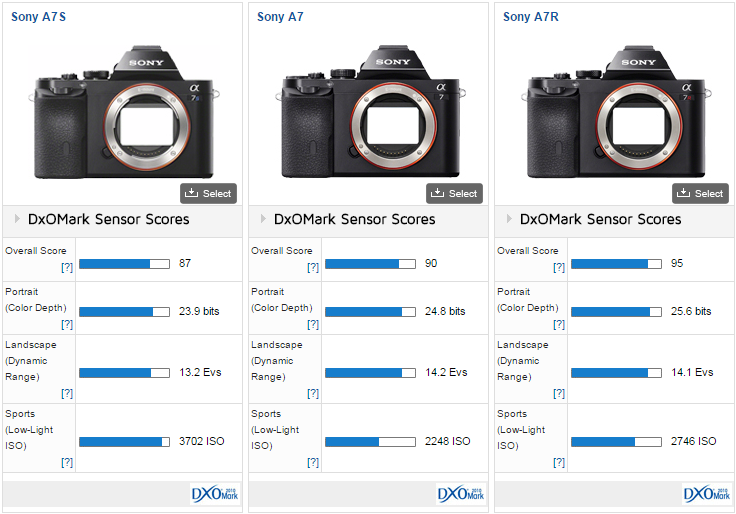 Click the links for results and reviews on the Sony a7, Sony a7S and Sony a7R and look out for our sensor scores and full review on the new Sony a7 II in the very near future. Just outside the top ten the original Sony a7 ranks in 11th place for all sensors on the DxOMark database with 90 points, 1 point ahead of Nikon’s pro D4 DSLR with 89 points.